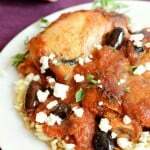 chicken cooked in a simple sauce of olives and tomatoes. Use 1 tsp of salt to slat the chicken thighs then place them into hot pan skin side down. Brown chicken on each side for 3-5 minutes or until skin begins to get crispy. Once chicken is browned remove and set it to the side. Add onion to the pan and cook for 2 minutes. Add white wine to the pan and continue to cook on high until liquid is reduced by half. Combine onion mixture, crushed tomatoes, olives, oregano, garlic, and salt to the slow cooker and stir to combine. Place chicken thighs into the sauce and cover. Serve over pasta with feta cheese for garnish.